To be fair to England, after a fairly rocky start they didn't have an entirely abysmal performance in the Germany game on Friday. In the second half especially they showed promise, and of course in true England style, there was a golden opportunity to win at the very end of the game - and we ballsed it up! Jordan Pickford and Ruben Loftus-Cheek really impressed, and there is certainly some cause for optimism since this is a largely inexperienced team compared to previous incarnations. Just days later, on Tuesday they now take on another top world team, this time Brazil. Despite being another home game, punters seem confident that this task is a bridge too far for England, and as such they're currently 7/2 to beat Brazil. Brazil are 4/5 to win and the draw is 5/2. Gareth Southgate, no doubt buoyed by the Germany draw, is not holding back from further mixing it up and England Under 21 side Lewis Cook, Dominic Solanke, and Angus Gunn may well feature. Eric Dier is expected to remain captain. Phil Jones is injured. Many fans will be pleased to see new blood given an opportunity at this level though, rather than some of the 'big names' who have let us down more times than not in recent memory. 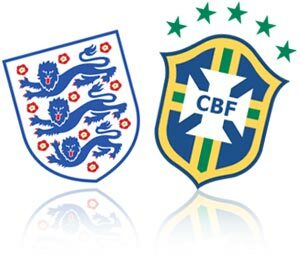 Brazil have a good run of competitive friendlies ahead (England, Russia, Germany) after an easy World Cup qualifying group and so are clearly going to give this maximum effort. Coming off the back off an effortless win against Japan, coach Tite is expected to field a top class side. Neymar and Paulinho must be up there as potential goal scorers with the latter available at 7/2. That would probably be my bet here if I was to show an interest. Enjoy the game!